Critics tend to pooh-pooh the later works of Agatha Christie, deeming many of them bloated, meandering and old fashioned. Miss Lemon begs to differ with this pronouncement. She holds up for her readers Exhibit A: Third Girl, published in 1966 -- forty-six years after Mrs. Christie's debut novel, The Mysterious Affair at Styles. Not only are the themes up-to-the-minute (at least for the 1960s), the pacing is sharp and the clues are deftly -- but not unfairly -- disguised. The plot is this: A young woman, modishly dressed, with long, stringy hair and a faraway look in her eyes walks into Mr. Poirot's office and announces that she thinks she may have committed murder. But, maddeningly, she isn't sure. Kidnapping, drug-taking, fine-art forgery and murder ensue, and all the while Poirot remains stubbornly at sea -- a most irritating state for the famed detective's little grey cells. The novel takes its title from a shared-flat arrangement. The young woman unsure of her criminal status is the 'third girl' leasing luxury digs together with an executive secretary and an art gallery employee. Poirot feels sure that this set-up holds the clue to finding how and if a murder took place, but he struggles to uncover it. Were it not for the help, albeit unasked for, of Poirot's compatriots in crime detection, he probably wouldn't have solved the mystery at all. Indeed, what makes this novel so delightful is its quirky cast of characters (a certain citrus-monikered secretary included among them). 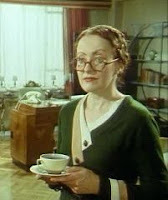 There's Mrs. Ariadne Oliver, a prolific crime novelist herself, in between books, who insinuates herself into Poirot's investigations so far as to get koshed on the head. Georges, Poirot's trusted valet, appears to make a few very helpful character assessments. And then there's Miss Lemon, "who was standing by, waiting to be efficient." In all, Third Girl is a fun, fast-paced whodunit worthy of Agatha Christie -- no matter what the critics might say. As if her fans don't know it already, Sept. 15 is Agatha Christie's birthday. To mark the occasion, Miss Lemon consulted her impeccably organised files and found a few fun things to do in honour of the day. 1. Test one's Agatha Christie acumen with an online quiz dreamed up by those clever book people at the Guardian. 2. Take an Agatha Christie blog tour. Please forgive Miss Lemon if she points out that she is featured on Tuesday. 3. Read any one of Agatha Christie's 80 crime novels or short story collections. Miss Lemon's personal favourite: Death Comes as the End (1945). A quirky choice, Miss Lemon realizes, but this novel's special allure is its ancient Egyptian setting, which shows that murder among polite society is no British invention. 4. Have a rock cake with Devonshire cream for tea. And if you've some raspberries on hand, pile them high. This was one of Agatha Christie's favourite treats. Miss Lemon begs your pardon whilst she marvels over the swift passage of time. She's not the first to observe the indifferent haste of the time-space continuum, she realizes; however the 15th of September, which will be so suddenly upon us, is Agatha's Christie's birthday. Were she alive today, she would be 119 years old. Good heavens. These books came out more than sixty years ago. And they are only the highlights. Mind you, there was a war was going on then. And when there wasn't, Agatha Christie spent a significant portion of her time helping her second husband, Max Mallowan, with a major archaeological dig at Ur. But lest Miss Lemon set herself adrift on a sea of sentimentality and stray from the purpose of her column, she'll use the felicitous occasion of Mrs. Christie's birthday to recommend her magnum opus memoir: An Autobiography. The book was published in 1977, the year after her death on 12 January 1976. But Agatha Christie had set to work on it in Nimrud, Iraq, on the second of April 1950. She wouldn't put the final period on it for another 15 years. As one might expect, the scope of Mrs. Christie's memoir is wide and richly detailed. Her characteristic joie de vivre tumbles over most all of the 644 pages. One will remark also her shyness and professionally uncharacteristic modesty. Mrs. Christie simply refused to view herself as a professional writer until well after the roaring success of The Murder of Roger Ackroyd (1926) and her divorce, when she turned to her writing to support herself. Even then, she looked at her success as a writer grudgingly and with a laundry list of qualifiers. Nevertheless, the narrative of An Autobiography belies her own assessment. She recalls vividly, for example, the creepy story of 'The Elder Sister,' that Agatha's own elder sister would tell to frighten her as a child. Madge would assume the low voice and shifting countenance of a mad sister sent away and now returned to seek revenge. Agatha would shriek with an equal mix of terror and glee. From that moment, she must have remarked that there's something intensely enjoyable about feeling afraid in the comforts of one's own drawing room. As in so many of Mrs. Christie's mysteries, the most simply stated observations can be the most revealing. Voyeurs and sensation-seekers, Miss Lemon fears, will be disappointed. There's no mention of Mrs. Christie's eleven-day disappearance: the 1926 mystery that led her husband Archie to be briefly suspected of Agatha's murder. But then, Miss Lemon wouldn't have mentioned it either. Indeed, Agatha Christie writes in preface to her memoirs, "I have remembered, I suppose, what I wanted to remember." That for Miss Lemon -- and, she suspects, for most of Mrs. Christie's admirers -- is more than enough.